The Claire Wiche Chronicles is an action packed paranormal series - witches, demons, and plenty of surprises wait for you inside the pages of each of the 5 books. Come on in and join the adventure. The action packed paranormal suspense series. When Annie Sullivan steps into The Wiche's Broom, all she wants is a crystal, and a distraction from her life. What she finds is Claire Wiche, owner, witch, and the distraction she never even dreamed of - an encounter with a ghost, and a request that throws them both into a murder mystery stretching back two hundred years. She's running from her past - and running out of time. Claire Wiche is an ordinary woman, running her Wicca shop, The Wiche's Broom, in an ordinary California beach town. But Claire wasn't always ordinary, and she isn't quite human. She hides a secret, and a past she thought she had put behind her. 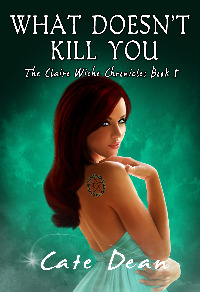 Claire Wiche sacrificed everything to keep her friends safe, revealing her true self. She expected the final battle to be the end for her. But she is back, breathing - and threatened by an enemy she doesn't have the means to fight. An enemy bent on vengeance and possession, whatever the cost. Trapped, alone, Claire has to find the strength to stand against what she knows she can't defeat. And the courage to face the people she thought she left behind. *Includes a short preview of Carry On Wayward Son, Book 3 of The Claire Wiche Chronicles. Now that new life is tested by a familiar stranger, and a ghost haunting that becomes much more. Claire and her friend Annie will have to face off with a volatile force, who traps them with his own needs. And Claire will face her true self, making a sacrifice that will change what she is, and what she will become. After an eventful few months, Annie Sullivan wants some quiet time, and some face time with her fiancé, Eric. She finds both in a small town in England. Until a life-changing discovery throws her into a sideways spin. Just as she begins to wrap her head around it, the trouble she thought she left behind follows her. Now she has to find the courage to use her power against an impossible enemy, and believe in herself enough to save the people who have become her family. The final book in the action packed Claire Wiche Chronicles. Claire Wiche is home, after surviving a curse that nearly killed her. What her friends don't know is the cost of fighting that curse still haunts her, and it is getting harder to hide. Until a stranger walks into her shop, with a tarot deck, and an aura of power that draws her in - and brings to the surface the part of her she thought long gone. Will her newfound strength finally be her downfall, or will it save her? The first 3 books in one boxed set! I'm very excited to offer this, especially with the gorgeous artwork by Nadica Boskovska. The final installments of the series in one boxed set, with more gorgeous artwork by Nadica Boskovska. Also includes and exclusive excerpt from Final Hours, book one of the Love In Time series, now available here.